– N-jobs delete table data and then re-insert all data using the main data from the AX table. Since N-jobs delete table data prior to writing, it deleted all of the existing items that we once saw in POS. This is as expected with N-jobs. 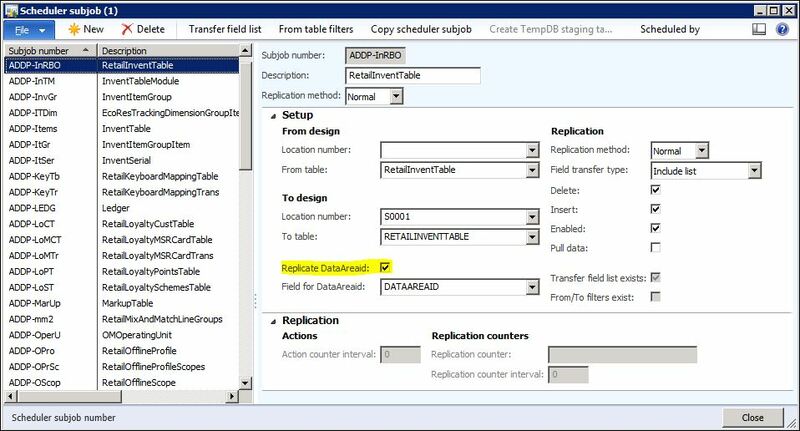 But due an accidental unchecking of the Replicate DataAreaID for a subjob, the rows in that table were then not inserted into the POS database during the scheduled job. To resolve this specific issue we located and corrected the N-1040 subjob ADDP-InRBO that updates the RetailInventTable. 2. Select Job Number N-1040. 3. Under the Subjobs fast tab, find RetailInventTable in the Description field. 4. Right click on the subjob number and select View Details. 5. Under the Setup fast tab, checkmark Replicate DataAreaID. 6. For Field for DataAreaid, select DATAAREAID from the dropdown. 7. Run the N-1040 job. This is a resolution only for our specifics scenario, but there could be many other factors causing items not to show at POS. Here are just a few additional (but not limited to) things to keep in mind if you come across a similar scenario of items not showing up at POS. – Check specific tables at POS that are related to the job you are running to see if any data is coming across. – Start or restart the Store Connect service. – Check the IncomingMessages and OutgoingMessages tables of your AXRetailMSG databases for connection issues. – Check your Retail Store Connect profiles to ensure a proper connection is set up.